Scientists have recently discovered a new species of human, Homo naledi, or at least they think they have. In September earlier this year, 15 partially complete skeletons of varying ages, ranging from infants and juveniles to one very old adult, were unearthed in the largest assemblage of fossil human remains ever discovered in Africa. 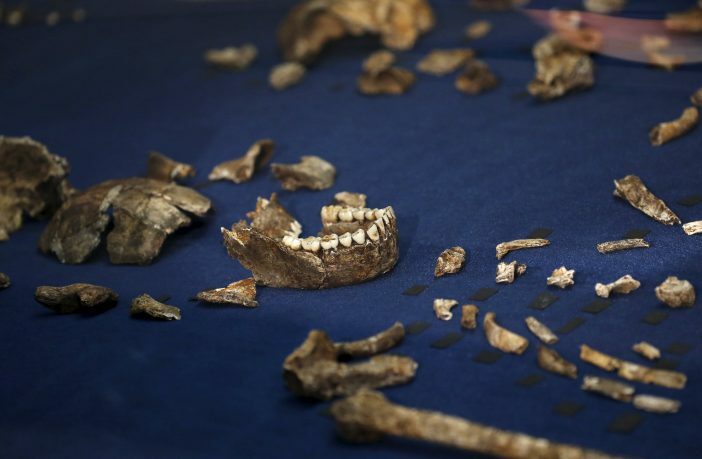 Over 1,500 bones were found in Rising Star Cave, 50km from Johannesburg in an eight-inch-wide crevice called Dinaledi chamber. The chamber was so hard to access that six lightly built female researchers were brought in to excavate the bones. The remains were not encased in rock, so dating the bones is very difficult. Carbon dating will provide an accurate date, but the bones will have to be destroyed in the process. This will only be carried out after the bones have been studied in more detail. Without knowing the precise age of the bones, some researchers see the artifacts nothing more than curiosities. It’s roughly estimated that Homo naledi is three million years old. This relatively young compared to the 4.4 million year old Ardipithecus ramidus, which was discovered in Ethiopia in the 90s. The pelvis of ramidus shows the first signs of adaptations to bipedal locomotion. If the bones turn out to be any younger than three million years then it’s likely that they are just early versions of Homo Erectus, a human ancestor that has already been discovered in South Africa. However, if the bones are more recent, then naledi could be a relic species that’s survived in isolation. When reconstructed, naledi looks slender, small-brained, long-legged, and “pin-headed” and “gangly”; well, I don’t know about you but I can think of quite a few people like that. The brain is the size of a gorilla’s, the teeth are small and basic, and the thorax is primitive and ape-like. Its hands, however, are more modern and are designed for crafting basic tools although curved fingers are a feature well suited to climbing in trees. Homo naledi has been placed in the genus Homo because of its advanced skull shape, small teeth, long legs and modern-looking feet; adaptations for walking upright on two legs. In spite of some modern features, it’s very likely that naledi is one of our oldest ancestors. Recent research that has been published in the journal Elife suggests that naledi was capable of ritual behaviour. This is vital for the use of tools in a repeated task to obtain food or the passing of information from one generation to another. Ritual behaviour may well have also given rise to early human culture, such as religious burials and art. We are kept partly in the dark until these bones have been carbon dated as to whether Homo naledi is indeed a new species of human.